I do three procedures on the baby piglets when they are a couple of days old. Pictured above is a freshly notched ear. Pictured below are the castration incisions after pulling the testicles out. The third procedure, not pictured, is an injection of iron into the neck muscle of the piglet. The first procedure is done to individually identify each piglet. The notch is easily readable for the rest of the pig’s life, so no other identification is needed. I use the international system, with the right ear designating the litter, and the left ear designating the piglet within the litter. I castrate the piglets to prevent “boar taint” in their meat. Boar taint is an offensive odor, released when cooking pork which has high levels of androstenone and skatole. 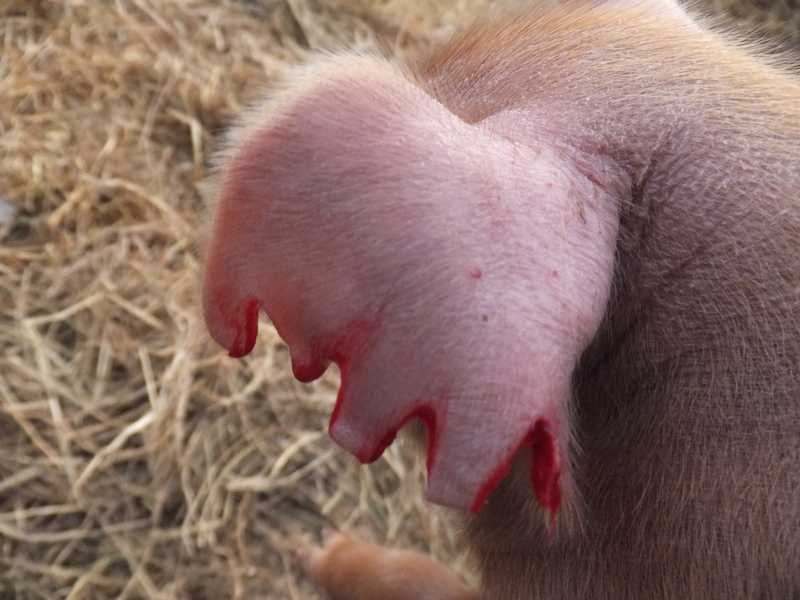 Castrating piglets nearly eliminates the chance of boar taint. Boar taint doesn’t occur in all males. Some producers use genetic lines with little incidence of boar taint. Some countries butcher intact males at a young age and lower weight to reduce boar taint. I’m unwilling to risk selling the meat from an intact male because of the potential to lose so many customers at one time. I also like to butcher my hogs larger and older than the industry average, believing this contributes to taste and marbling. If I didn’t castrate, I would have to keep the boars separate from the gilts, or the boars would be breeding the gilts before marketing. Sow’s milk is deficient in iron, so piglets will suffer from anemia if another source of iron isn’t available. On pasture, that source can be soil. Since my piglets are on bedding, I decided to continue to give an injection of iron. Iron injections are ok under organic protocols. I’ve given vaccines to my swine in the past. It’s best to wait until piglets are three weeks of age or older to administer the vaccine, as this is when the passive maternal immunity is wearing off, and the piglet’s own immunity is developing. As this would require catching piglets, I think I’m going to try not using any vaccines. I would like to make a video of my piglet processing protocol and post it on Youtube. I’ll let you know if I ever do. This entry was posted on Monday, February 27th, 2012 at 12:18 am and is filed under Curious hogs. You can follow any responses to this entry through the RSS 2.0 feed. You can leave a response, or trackback from your own site. This is so helpful and interesting! My dad talks about doing this as if it were no big deal but to see the cuts helps me understand. I do hope you post a video! Do you sacrifice some growth potential by castrating at a young age? Yes, barrows grow slower, with more fat and less lean, than boars. This blog is a great blast of honesty to those of us separated from the food chain. Many of us love animals, and many animals are endearingly cute. But if we eat them, someone has to deal with the markings and castrations etc. Fact of life – if you can’t handle it, go vegetarian. If you don’t want to be vegetarian, then accept it. I’d rather be able to know that the people I buy my meat and poultry from have taken care of things in a clean, orderly, as humane as possible way (the pigs probably want to keep their testes, but hey, that’s the breaks). Thanks a lot, MJ! This is one of the reasons I write this blog. Also, the interactions with all of you help me see what I do in a different light as well.